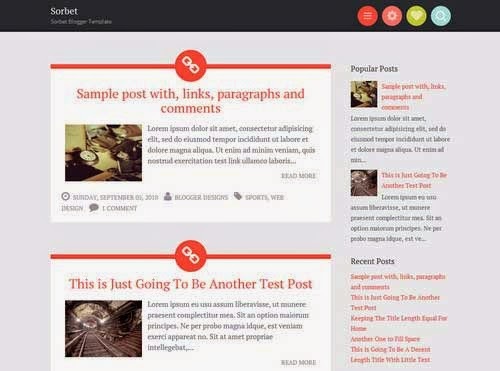 Blogger is the simple but feature rich blogging platform. 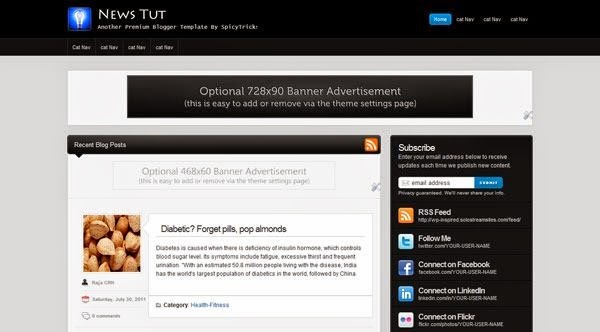 Like any other Blogging system, You can create your own Blogger template for your blog. 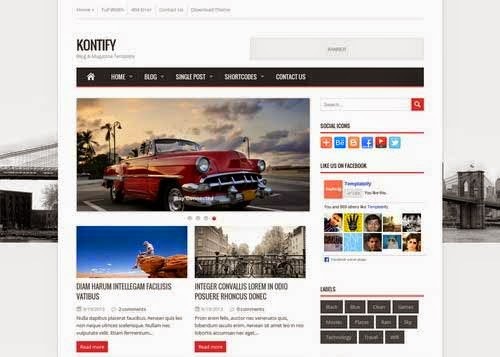 If you are not Web designer, You can get the Unique Blogger Template designs from our connection for 2014. If you want to start a blog and you are new to blogging, Google’s Blogspot should be number one choice to learn the Blogging tactics. 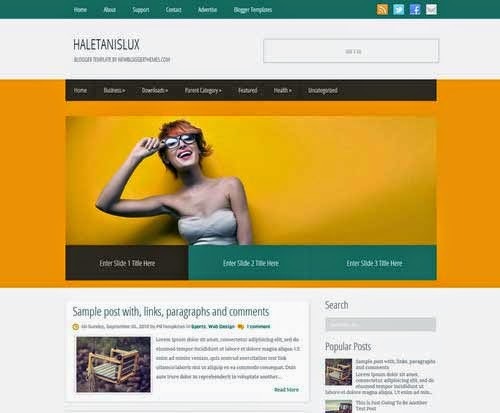 By default Blogger offers many Beautiful best Blogger Templates for free and you can also install many custom-made free blogger templates from Internet. Internet offers the vast collection of Magazine blogger templates for free to download. But choosing the best free blogger/Blogspot template for your blog is a tough and tired one. Here, We have collected many best free blogger templates for your blogger blog. Most of those Blogger templates are designed by web blog designer and many of the blog templates are converted from best WordPress Themes and some of them from HTML /CSS website Templates. 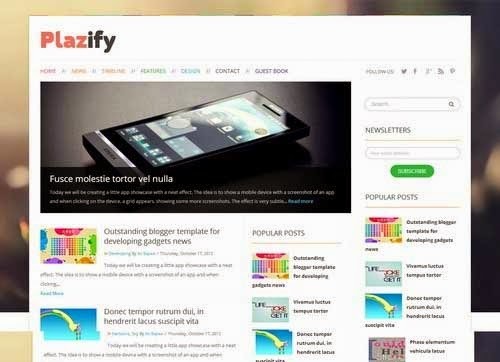 In this Blogspot Templates collection, We have included the Responsive Blogger templates, and most of them are magazine style suitable for Magazine Blogs, Personal Blogs, Movie Blogs and Gaming Blogs. Get ready to install the Awesome Free Blogger Templates in your Blogger Website and stand out from the crowd!. Bresponsive is the Magazine style Responsive Free blogger template for all tech, news blogs and more. It offers premium features for free and also We should point out that there is no other blogger template like this anywhere. 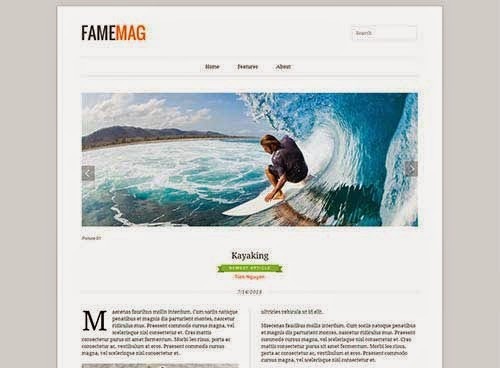 Gamer MagZ is a new Premium yet Free Blogger Template from us to all bloggers. The Layout of this web templates is combination of Magazine style with blog style. This free Magazine blogger Template has 2 columns, Popular Widget, Recent Post widget and Blogspot Category Post Widget with thumbnails. 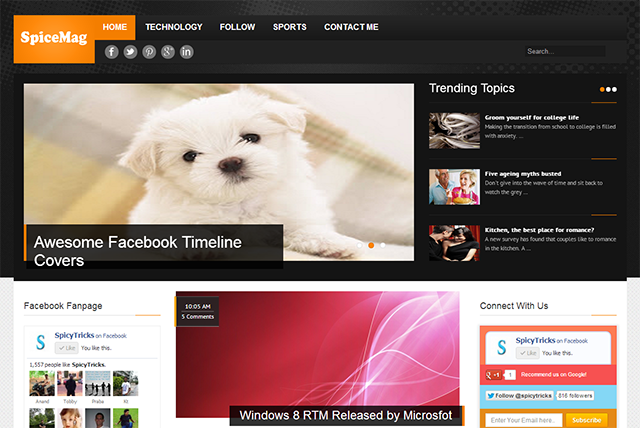 Blogger News Times template is specifically designed for News Related Blogger Blogs. Also, You can use this for Magazine type Technology sites and as well as News Blogs.You can use this template for free. 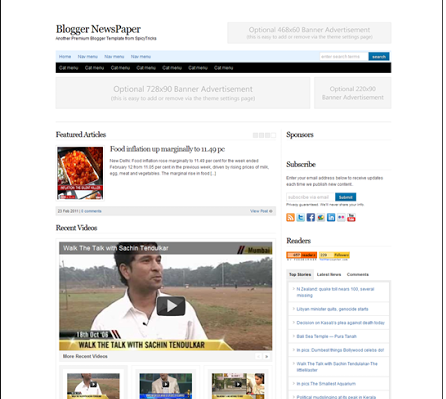 Blogger Newspaper is another template that fits the news or CMS blogs. It has more white space and simple design which will attract many more users to your blog. 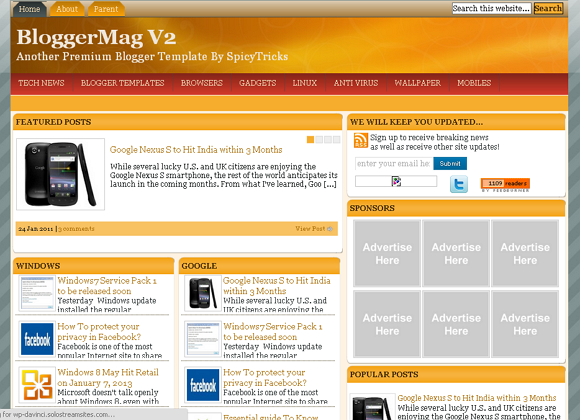 Blogger Mag V2.0 is designed for regular blogs that publishes posts daily. 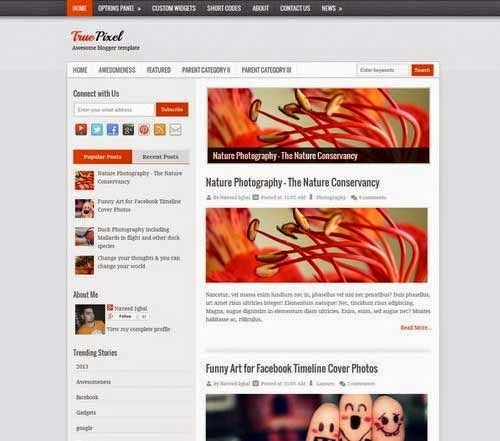 It has awesome slider and other premium blogger template features. Easy News is Responsive Blogger template that offers a wide range of features which can be found in the Premium WordPress themes. Fabric is the Premium style blogger template with nice typography and design elements. You can use this template for personal blogs. This Blogger template offers responsive design with featured slider and many features. 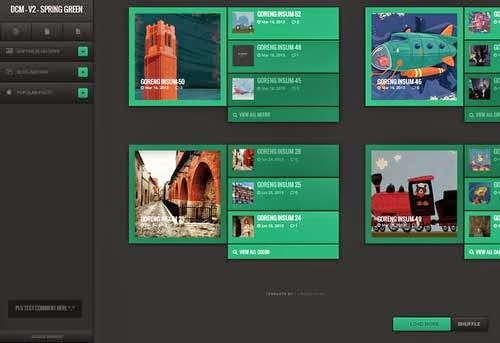 Plazify has 3 columns design with Responsive layout. You can use 2 sidebars which is useful to show full of contents. Sorbet is Responsive Blogger Template converted from WordPress theme. 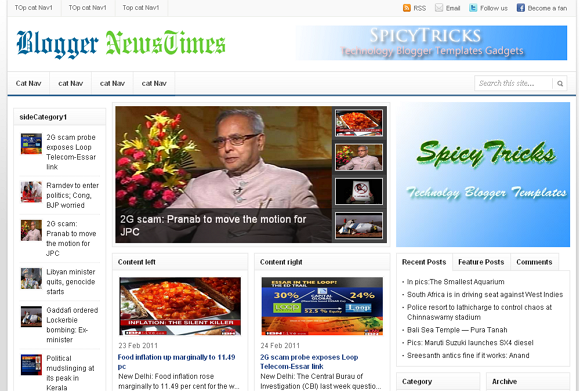 It offers large space to showcase your content in an elegant way. 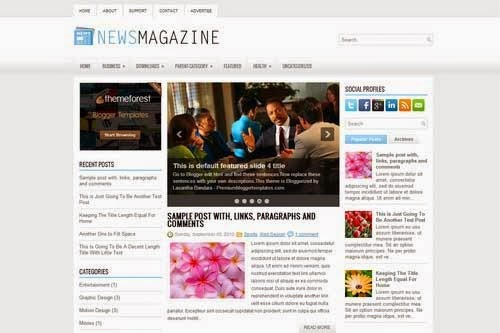 NewsMagazine is another 3 column Blogger Template which offers Right and Left Sidebar. 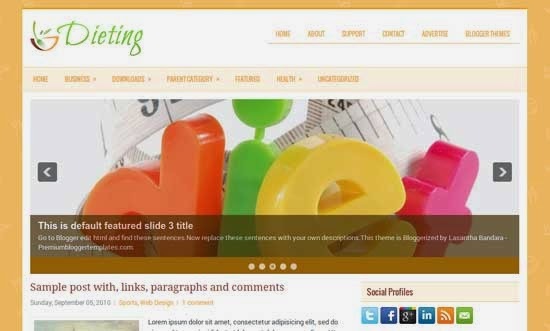 Dieting Blogger template can be used to Lifestyle Blogs which has Responsive design and amazing slider. If you want personal Blog Blogspot template, then ‘Moments’ is the fantastic option for you. It has nice Responsive Design with menus on left sidebar. 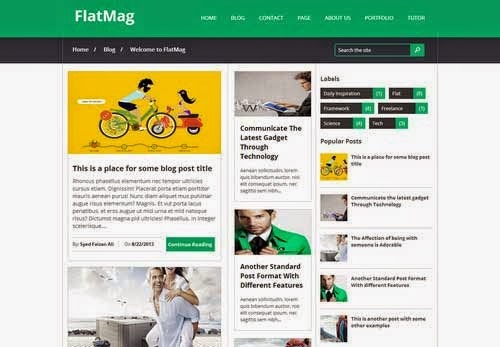 Flat Mag has come with beautiful color scheme with responsive Design. You can use this template for any content-rich blogs. 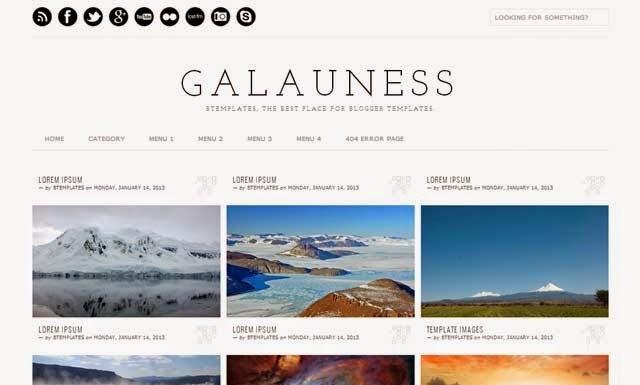 Galaunes is Responsive Blogger Template with Grid system layout. You can use this template for portfolio blogs and also any other blogs. 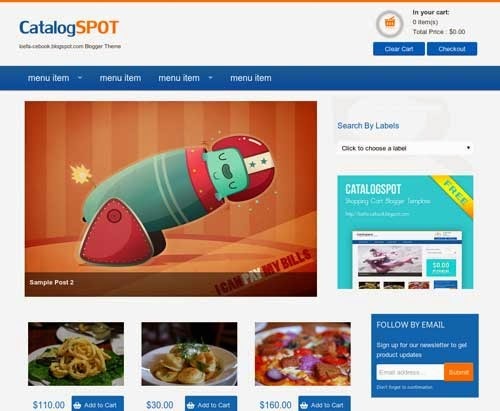 Catelog is E-commerce Blogger Template with Responsive layout. It has the Grid style design which will be useful showcase your products in the Online store. Movie is the perfect choice for the Movie blogs. You can showcase the movies with two different style. If you run movie blog, download this Movie Blogger template. 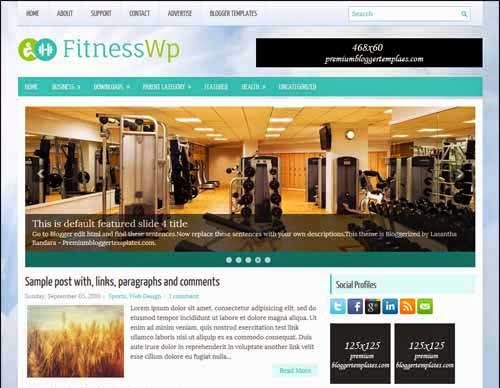 FitnessWp is Responsive Blogger template which can be used for Magazine style and Fitness Blogs. Trube Pixel can be used for any kind of blogs which has got attractive design and Typography. Spring Green has got a different design completely compare to any other templates. This template can be used for Photography blogs. 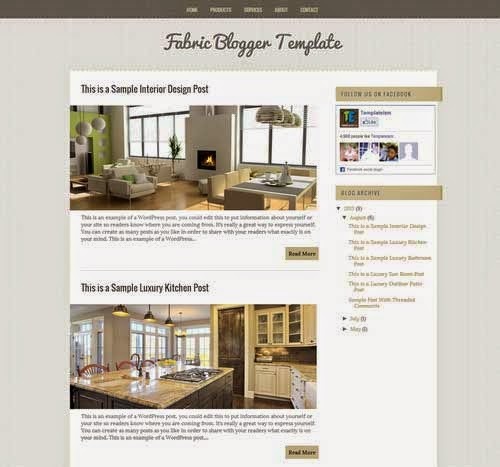 Share your thoughts about this blogger templates in comments..
New Blogger Templates for 2014 Updated regularly. How to Add Flying Twitter bird. Most Commented Posts Widget for Blogger with Comment bubbles! Mithilesh Joshi. Powered by Blogger.